I lOVE pretty cupcakes. Love, love, love. But I never knew how easy or beautifully you could decorate them, until my girlfriends and I discovered fondant. Anyway, this stuff is amazing! Have you ever worked with clay or Sculpy? Well, you can do with fondant just about anything you can do with clay. I'll bet even kids can do this (and maybe better than us grown ups)! 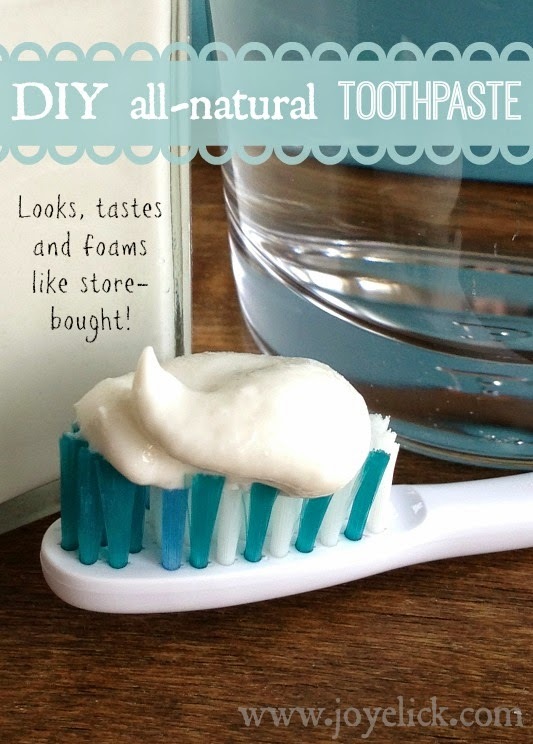 a frosting bag and writing tip. 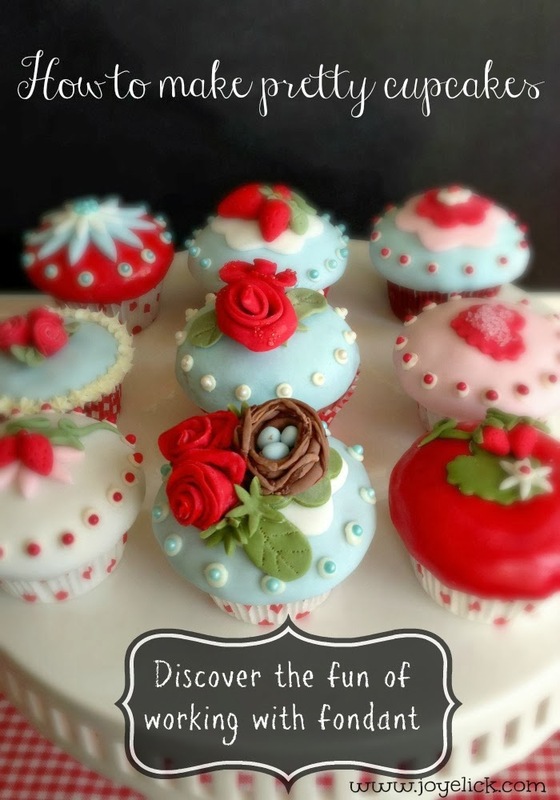 Want to discover the fun of fondant for yourself? Read on! 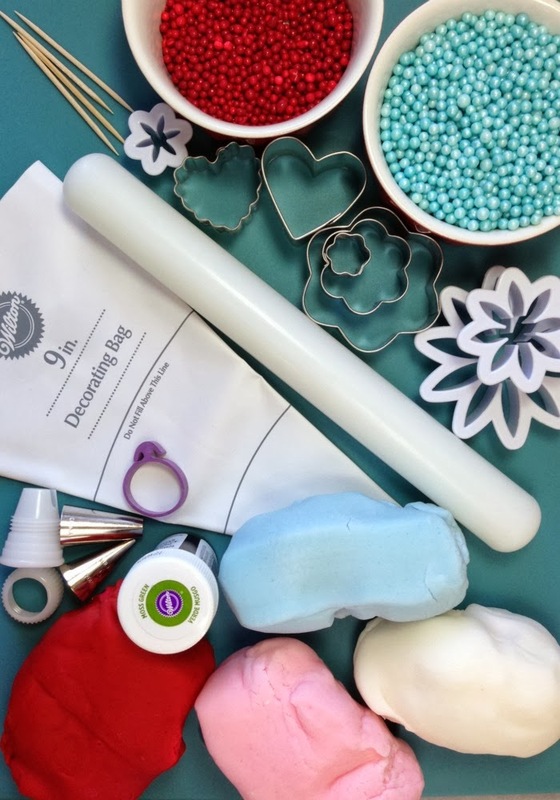 Here are the supplies you will need for working with fondant. I found my supplies at Michael's Craft Store, but lots of craft stores carry cake decorating supplies. If you can't find what you need at a local craft store, you can visit the Wilton website, where you'll find absolutely everything you'll need. How to roll fondant. Fondant will likely be a bit stiff at first. Before you can roll it, you will first need to work it with your hands the way you would a piece of clay. Break off a piece to work with (keep the part you aren't using wrapped in plastic). Knead the fondant until it is soft and flexible. If it is sticky, dust it with a small amount of confectioners sugar. Roll the fondant into a ball. Dust the surface you will be rolling the fondant on with confectioners sugar. Using a hard smooth fondant roller, roll the fondant like you might a pie crust. You will need to flip it over frequently, re-dust the rolling surface, and continue rolling. Roll the fondant until it is an 1/8 inch thick. Now you're ready to cut it. Use a wide-mouth canning ring to cut the perfect size circle needed to cover a standard cupcake top. sugar. Form fondant into a ball. cut a circle to cover a cupcake. 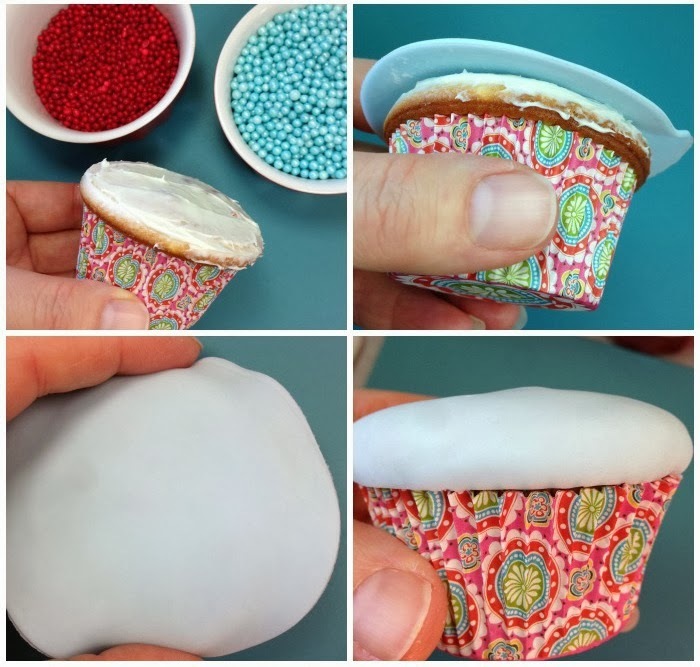 How to apply a fondant cover to your cupcake. I know there are ways to cover the entire cupcake, but this isn't really necessary. I like to keep my cupcakes in their pretty paper liners and just decorate the top. This is easier and requires less fondant. Spread a thin layer of buttercream frosting over the surface of a cooled cupcake top. Center the circle cut-out on top of the cupcake. Press from the center out to the edges of the cupcake with your fingers. If the top looks bumpy, gently rub your fingers over the surface. It should smooth out. Press the edges of the fondant circle to the underside of the cupcake dome. (You can trim excess fondant with scissors if necessary, then press the edges in place). Once your cover is in place, you're ready to decorate your cupcake. frosting. Center your circle cut-out. Press from the center to outer edges. Smooth surface with your fingers. How to custom color fondant. Coloring fondant is super easy. You can blend ready-made colors (Wilton provides a blending chart here), or you can use white fondant and add any icing color you wish. To make the green for my strawberries picture below, I used Wilton's Moss Green icing color. Simply insert a toothpick into the color, then poke the color-dipped toothpick into the white fondant. Knead the color throughout the fondant until it is worked into one consistent shade. Insert toothpick into icing color. Poke dipped toothpick into fondant. the fondant with your fingertips. How to mold fondant into sculpted forms. Fondant has a smooth flexible consistency. Besides being able to roll it out and cut it with any shape cookie cutter you can imagine, you can sculpt this stuff just like you would clay. How to attach cut outs or sculpted forms to a fondant covered cupcake. 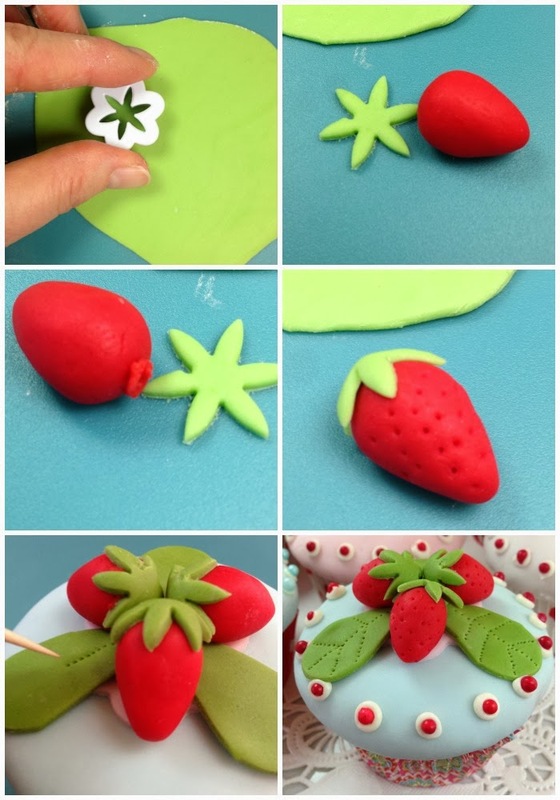 To attach fondant pieces together, just apply a small bit of frosting and "glue" them together. It's simple. Now that you see how easy decorating with fondant is, you'll want some inspiration. Here are some of the cupcakes my friends and I made. How to store fondant. Unused fondant can be stored for up to two months if sealed in an air-tight container or a plastic bag that zips. Once on a cake or cupcake, it can be stored uncovered for up to four days at room temperature. Keep it out of direct sunlight, as this will change the coloring. Fondant should not be refrigerated. 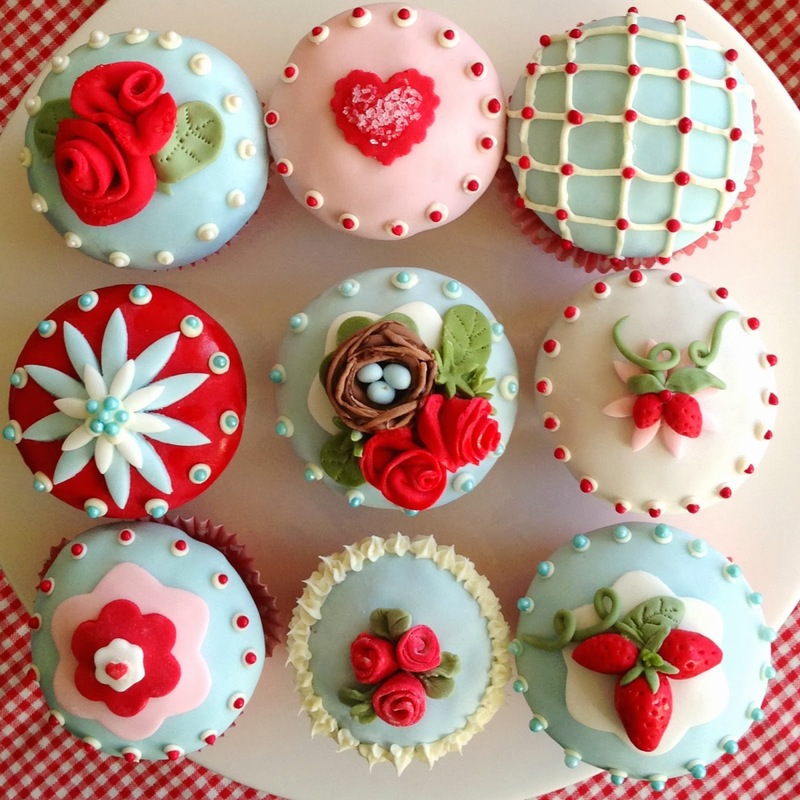 Avoid using fondant on cakes with fillings that require refrigeration. Some final thoughts... Do you know any good tips and tricks for working with fondant? What other decorating techniques to you enjoy? I'd love to hear from you in the comments below. P.S. You can find other amazing decorating ideas here, on one of my Pintrest boards. 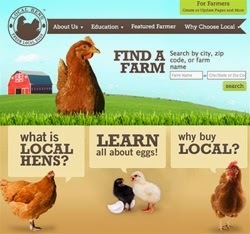 Awesome story! Congrats on the successful team work! read this above post its very greatful for me thanks sharing this post ,great post.